2016 has brought a lot of changes to Jeevan Sahara Kendra – and one of the biggest one is that as of January 2016 we are operating out of the Bethany Hospital! 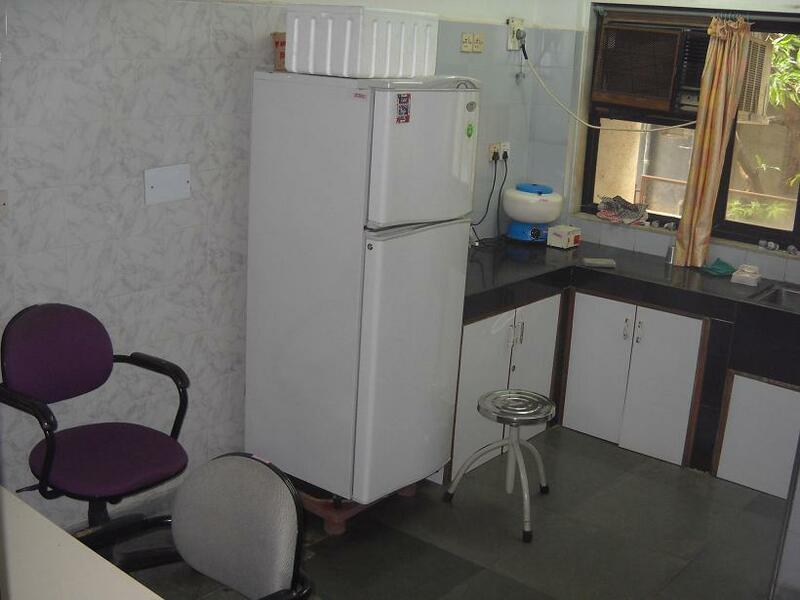 Jeevan Sahara Kendra is committed to providing the same high quality of home-based HIV care in the Thane urban area and some of the surrounding suburbs, but will be working out of the JSK office situated in the upper basement of the Bethany Hospital. We are also continuing our Integrated Testing and Counselling services for HIV counselling and free HIV blood testing. Please call Mr. Giri Nayak for appointments during the week. There is also we weekly counselling time from 1 PM – 5.30 PM every Friday afternoon – which will be held at the Jeevan Sahara Kendra office at Bethany Hospital. The monthly Positive Friends support group meeting will continue on the last Wednesday of the month from 3 PM – 5.30 PM. Please note that it will be held as before in the old Lok Hospital Building – not at our new office in Bethany Hospital! Please note the new JSK office telephone numbers: 022-2172 5156 and 022-2172 5256. 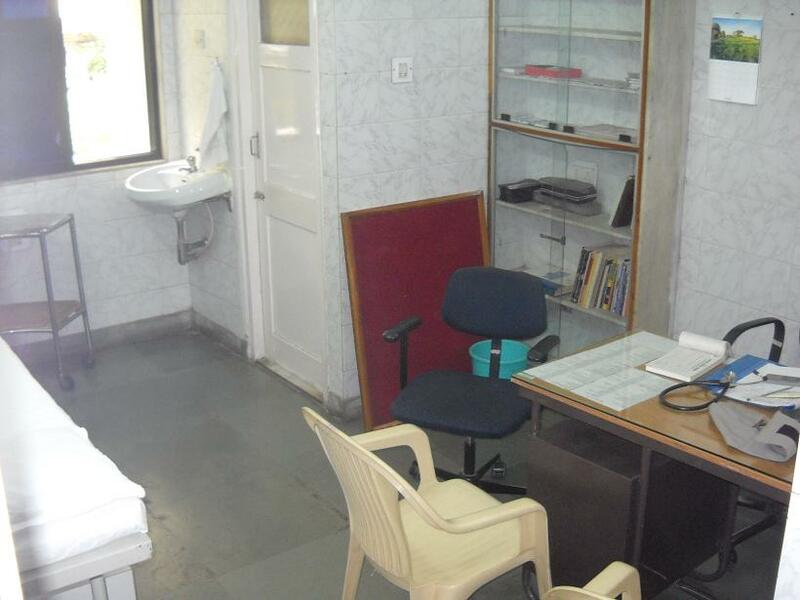 (Do note that the staff mobiles will not work when they are in the office since the reception is poor). We look forward to keep serving all of you! In India about 2,400,000 people will awake and go about their daily chores. The thing that sets them apart from their fellow countrymen is that their bodies have the HIV virus in them. Many of these 2.4 million do not know that they have the disease. Without doing an HIV blood-test there is know way we can tell a person has HIV. Many do not think they are at risk – and some who know that they may have HIV are too scared to test. But only if we test for HIV can we start treatment. Testing is key. Today the Jeevan Sahara Kendra is conducting an HIV awareness and testing camp at the Gandhinagar Primary Health centre in Thane. As I write we already have counselled and tested 50 people – many of them TB patients who come 3 times a week for their medications from this govt. health post. We want more people to be tested. Testing means that I am willing to find out the truth about my status. That I am concerned about who I am and how my actions will affect others. Getting an HIV negative report is wonderful news – and will help me change risky behaviours since I have a huge incentive to stay HIV negative. If I find myself HIV positive – then now is the time to start treatment – so that I *can* live long. On this World AIDS Day we salute those with the courage to know the truth. The Bible tells us that ‘truth will set you free.’ We know this is true. We also salute all those who are helping people with HIV. Through our work we know of many unsung heroes who are doing what they can. In the govt. sector we salute the doctors and public health nurses who meet people with HIV and help them with ART and TB treatments. We salute the name-less volunteers from local churches who go and visit people with HIV in their homes – and who welcome their ‘Positive Friends’ into their homes too. We salute all those who quietly help financially when widows struggle to pay room-rents, and who bring food for people with HIV who are destitute. We salute our Positive Friends themselves. What a thrill it is for us at Jeevan Sahara to hear each month the stories that People living with HIV/AIDS tell during the support group meeting. We salute ladies like Kavita who are bold and telling their tale to others. We are so proud that tomorrow – during Mumbai AIDS Sunday 7 of our HIV Positive Friends will be telling their stories in different churches – and challenging people to love and care as God does. Today is an ordinary day. Full of extra-ordinary people. We salute you all and are so privileged to work together with you! Some know but are trying to avoid addressing it. Anti-retroviral Therapy (ART) medicines are the life-line to living with HIV! At the recent International Conference on HIV in Washington DC (USA) it was said that a person with HIV in Uganda who is 35 years old now – and has a CD4 count of higher than 100 – and starts on ART and takes it faithfully is now expected to live for more than 35 years! That means that taking ART regularly can allow you to live just as long as you would expect to live if you did not have HIV. This is great news! And we are not talking about living in the ‘advanced western countries’ – the Uganda estimate is for a country with a health system and standard-of-life situation similar to what we have in India! But did you notice that in the second paragraph we highlighted 4 words: and takes it faithfully! If I have HIV and I do not take the medicine very, very, very regularly…. well, then it just won’t work! This is what we call ‘Adherence’. It means being able to take the medicines you have been prescribed completely! All the drugs – at the right dosages – at the right time – and in the right way! If I have HIV and I take my meds properly – then the amazing immune system God has given me can be rebuilt. My body can fight off all the other diseases that are trying to bring me down. But if I do not take the medicines properly – well – then the medicines will stop working. Period. There are other sicknesses like diabetes – where if I miss some meds then I can compensate by increasing my doses later. HIV does not work that way. If I miss my meds – then I am giving the virus a free ride to become resistant to the meds. Take a look at these pictures. They illustrate what happens in the body of a person with HIV who is taking their ART meds twice a day. After a person takes their morning dose at 8 AM, the level of the drugs in the blood increases till about 2 PM, after which they start to drop. But they never go down to ‘zero’ because at 8 PM, the next dose is taken and the level of drugs increases again. The pattern is repeated the next day. 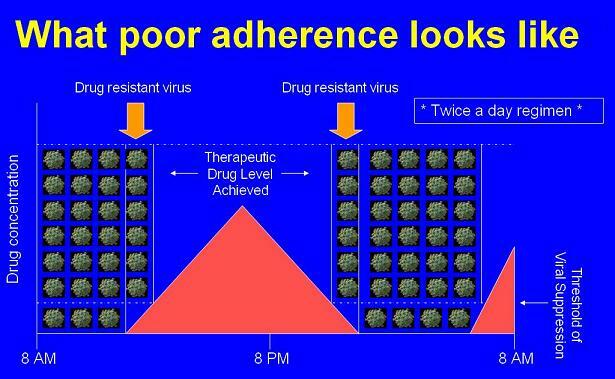 The most important aspect is this – by regular taking of ART at the right time each day, the level of drugs in the blood never drops below the ‘Threshold of Viral suppression’ (shown in the picture in yellow). This means there is always enough drug available to suppress the HIV. You suppress the HIV – and it can’t reproduce! That is why good adherence to ART medication should result in the person with HIV having no detectable HIV in their blood! That’s great news! It means that the bodies CD4 cells are then able to replenish themselves – and the overall immune function can improve – leading to a restored immune system! And we are seeing this happening over and over again. People on ART who are taking their meds properly – are getting so, so much better. Are able to work again. Are living to see their children getting married! Amazing stuff! 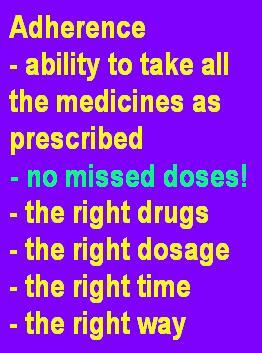 But all of this depends on taking the medicines in the right way – faithfully! Here is what happens if the ART meds are not taken regularly. 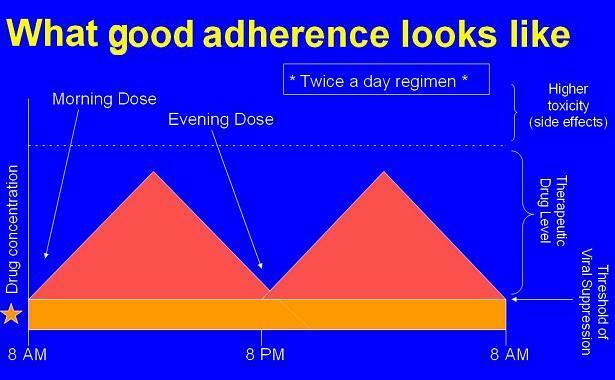 In this case, the person took a dose at around noon – and then the next dose the next day at about 5 AM. As you see in the picture above, from 8 AM to noon there are no ART drugs circulating in the person’s blood at all – because they have not taken their meds. Even when around noon they take their dose of ART – it still takes about an hour for it to come to a level where it will suppress the HIV virus. So from about 2 PM the ART is now able to suppress the HIV virus – the levels increase till about 6 PM, when they start decreasing again. Around 12 AM the levels of ART dip below the minimum threshold needed to suppress HIV. From now on the HIV can multiply again. And the next dose is only taken at 5 AM, which means another hour or two before the minimum threshold is reached. As you can see – whenever there are no ART drugs circulating in the blood – the HIV is reproducing. More HIV means more attacks on the CD4 cells. And even more importantly – when the ART drug is present in sub-optimal levels – the HIV that is reproducing at that time can become drug resistant. This is why some people who are being treated on ART experience drug failure. They have opened up doors for the virus to keep reproducing even though they are taking ART meds. Sadly – some of them allow their HIV to become resistant to the ART meds. The shocking thing is this – even people who think that they are taking their meds regularly may be opening up the gates for HIV to reproduce. And for people who are less regular … well the figures show that most of them won’t reach the goal of suppressing their HIV. My dear friend – if you are reading this and you have HIV – please do take your ART faithfully! It is such a gift to be able to have these meds! They can take you well into old age. You can become old – just like all your friends and relatives who do not have HIV expect to get old. But they will only work if you take them very, very, very regularly. 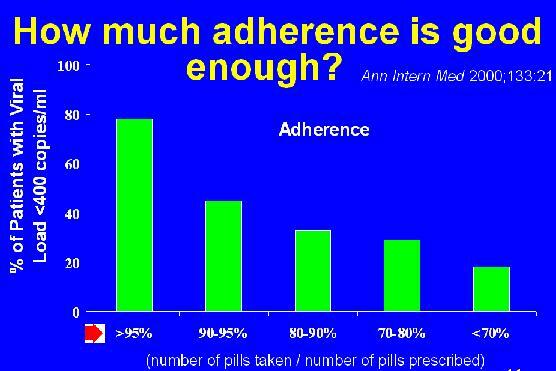 You have to achieve an adherence rate of over 95%. That means that if you are taking your meds morning and evening – you have to miss less than 3 doses in 3 months! Remember – the key to your long life is in your hands. Those ART tablets are a gift from God. Take them. Regularly. We want to see you live. And we all want to see you live long and healthily! 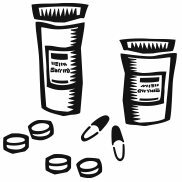 If you are reading this and you have a friend or relative who is HIV positive – please do encourage them to take their meds. It is often a challenge to take the meds regularly. No one likes to take pills – and that too life-long! But if your loved-one does take their meds – and takes them regularly – then they can have a long life! Your part in encouraging and helping out your loved one is vital. Be there for them. Keep positively talking about the need to take the meds. Pray with them. Find out when their next ART appointment is. Offer to go along with them to the doctor. Tell them how valuable they are. Show them you care by being with them through the thick and the thin of things! We all need each other. ART meds are a great gift from God – but are not always easy to take. But once we start on them, we have got to keep taking them. If we take them regularly… then we can live looooooong! Don’t stop! Keep taking your meds! And make sure you take your meds faithfully! We want to see you old! We as the Jeevan Sahara Kendra family have already entered our 10th year of service. We feel that it is time to celebrate! Time to thank God for His mercy in using us over these years. Time to recognise our partners and supporters and all our friends who have made this 10th year of service possible. We would like to invite all our friends and well-wishers to a special time of celebration and rededication of the JSK Community Care Centre! Please join us on Friday the 23rd of September at 7 PM (sharp) at the Jeevan Sahara Kendra Community Care Centre. We are thrilled to announce that the Jeevan Sahara Kendra is now operating out of our new Community Care Centre in the Lok Hospital Building. 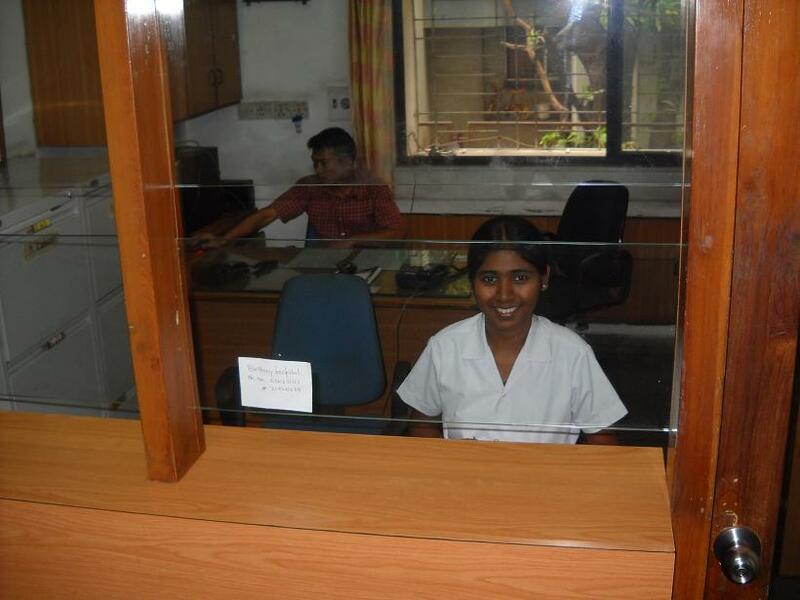 Welcoming smiles at the main reception counter. 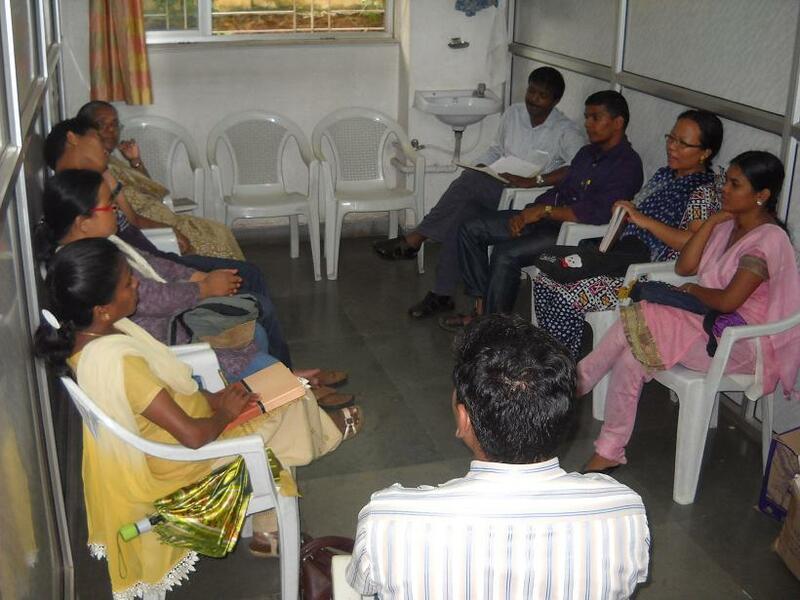 And finally – the most important part of our new centre – our staff – here the Home Based Care team discuss their morning home-visits to people who have HIV and are living in Thane. After a long wait, we are finally moving! 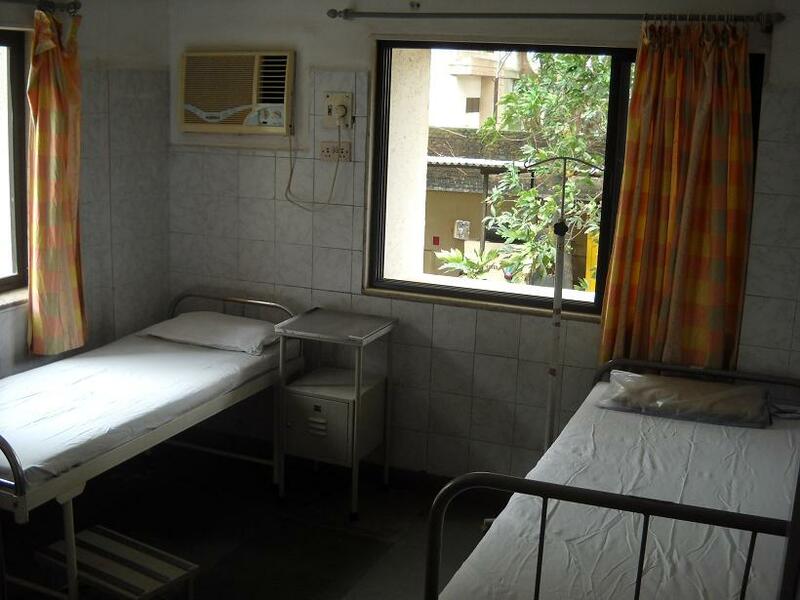 From tomorrow morning, the Jeevan Sahara Kendra will operate out of the Lok Hospital building. We are moving our clinic over this afternoon. Its an exciting time. We see many new opportunities opening up for us. We have a pretty amazing set of people working with us at Jeevan Sahara Kendra. We did not realise we have a champion power-lifter in our midst. Last weekend Santosh Sable – one of our family case managers – participated in the “Mayor’s Cup” lifting competition organised by the Mumbai Municipal Corporation. Competing in the 60 kg category (he weighed in at 59.25) Santosh managed to lift 82.5 kgs in the bench press, 170 kgs in the squat and 215 kgs in dead lift. This comes to a grand total of 467.5 kgs – almost half a ton! That almost-half-ton was enough to get Santhosh first place in his division! Hooray! 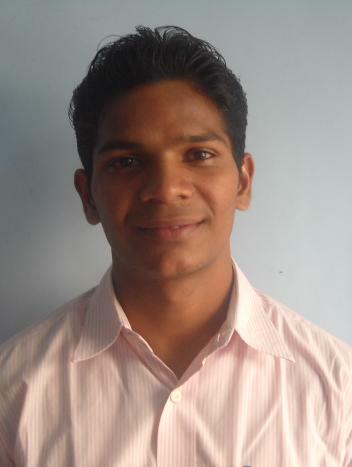 We are thrilled with Santosh – who has been with us since December 2010. We knew that Santosh visited the gym regularly – but little did we know that we have a city-wide champion in our midst!